These buttery melt in the the mouth cookies are so scrumptious and not too sweet. At times other nuts such as almond, walnut and the like are added to the dough. It takes a bit of your time for rolling this treat. I had rolled them into tiny balls. 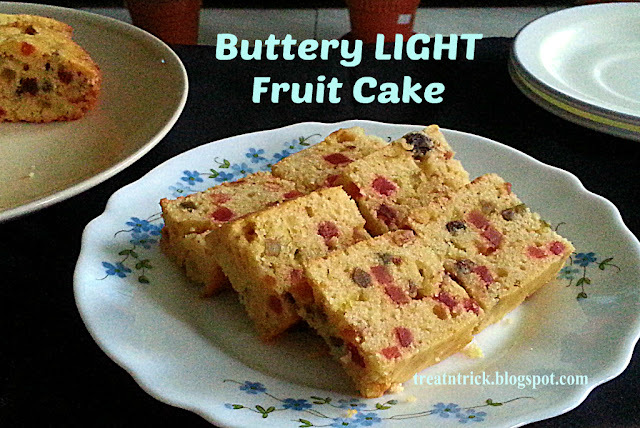 They are often served during Christmas, wedding or festive celebrations. If you have a time, dry roast or bake the pecan before grinding. This step is not neccesary but that really enhance the flavor of these balls. Stir in flour and ground pecan, mix well to form into soft dough. Preheat oven @ 160 C.
Roll dough into 1 inch ball and place into baking sheet. Bake for 20 minutes until set but not brown. Remove and cool on wire rack. 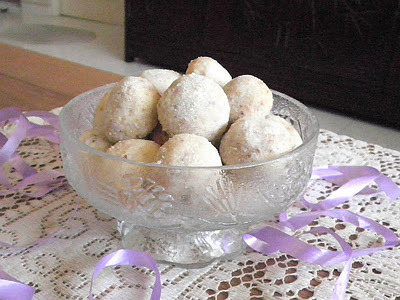 While still warm, roll the balls with powdered sugar until well coated. I like the ingredients! I am sure I would love these cookies! These look delicious. I love your blog. I love these little pecan balls! They definitely look like they would just melt in your mouth. Lovely picture! I would be a fan of these treats too! Perfect cookies for the festive season! Love the ingredients. 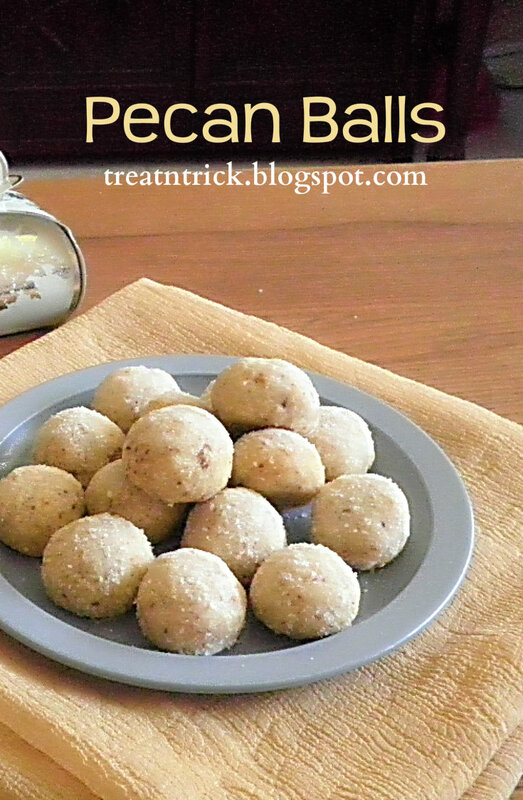 The pecan balls look lovely. My first time here. Following you. Kak kita terlepas yang ni.berangan2 nak buat truffel tu sampai hari ni belum buat lagi.Bahan dah ada. Yang ni pun nampak sedap ni. Love these buttery pecan cookies-they are a must for this holiday season. Yum! Tempting pictures-thanks for sharing this. That will surely melt in mouth..looks like snow balls!! 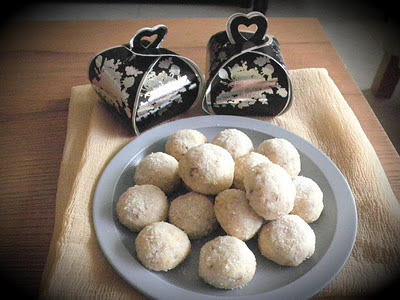 Pecan balls looks damn cute and pretty. Perfect recipe for this season. Love it. I make these every year at Christmas. We call them Pecan Sandies. Love them! yummy pecan balls, tempting ones.. These look soooo good. I don't bake much but these are worth a try, thanks for posting! 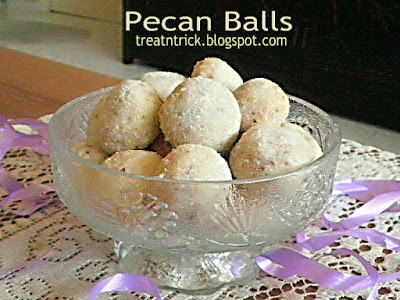 Loved these pecan balls a lot. Looks delicious. I love these cookies! They're one of my favorites to snack on!